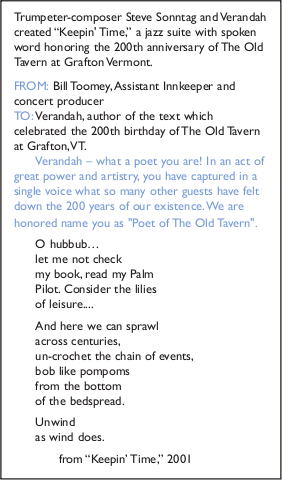 Verandah performs her poems- spoken and sung. Her delivery is intimate, interactive, accessible, and quirky. You want to join in, take up a pen or hum. Verandah offers keynote addresses featuring the eloquence of ordinarypeople. Address may lead into icebreaker activities. Verandah guides participants through the creation of told poems with their neighbors. The creative process and the shared told poems build trust and warmth among strangers. with jazz, pop and classical musicians, creating songs and spoken word suites. WATCH FOR THE NEW CD! Verandah and The Dysfunctional Family Jazz Band featuring original songs by Patty Carpenter and Verandah Porche, produced by Scott Shetler. "COME OVER" a song about old friendship and bad weather, with spoken word by Verandah. To find out more about hiring Verandah to read, entertain, or open conferences, or for additional information please click here.